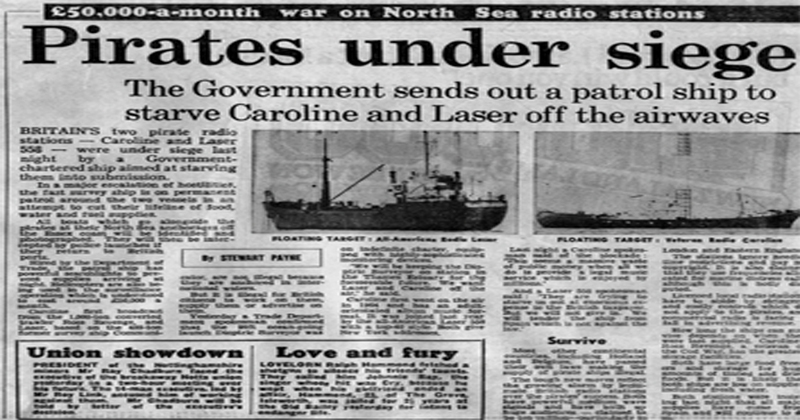 During August 1985 the British Department of Trade & Industry chartered the vessel Dioptric Surveyor, at a reported cost of £50,000 a month, to monitor the comings and goings of both Laser 558 and Radio Caroline. Positioned in the Knock Deep between the MV Communicator and the Ross Revenge, it was the Dioptric Surveyors task to monitor and report on any vessels supplying the radio stations ... subsequently attempting to starve the stations out of existance. The best recollections from this period in Caroline's history can only be described by those that were there at the time. I was on air on the first Thursday of August 1985, I was doing the Caroline breakfast show when this very smart boat called the Dioptric Surveyor came past and circled us very close. We all went out on deck and gave them a wave, they did not wave back I seem to remember - then the boat left us and headed out in the direction of the Kent coast. We saw no more of the spy boat (as we later called it) that day. On the Friday, again I was on air at around 9ish, the Dioptric Surveyor returned and circled us very closely, almost coming along side. Still at this stage we had no idea what she was up to, but we did make it very clear we were a registered Panamanian ship in International waters, and that we were breaking no laws. Still no communications from them. On the Friday it seemed it was Caroline they were more interested in, rather than the Laser 558 ship a mile and a half away. When on the Friday evening they did not leave and just hung around the Ross, we started to think Hello something's up here, and also thought that if they were still around on the Saturday morning that could be fun - as we knew we were due to get a fuel boat out from Europe, and at the weekends in the summer we had sight seeing boats out from Essex and Kent. Saturday morning came as did Caroline's European tender, our tender just came alongside moored up and off loaded a load of fuel, food and water. The Dioptric Surveyor crew tried at this stage to get pictures but needless to say we made it hard for them to do this, placing canvas covers over fuel pipes etc. At around the same time this was going on we had a sight seeing boat come out from Essex, they went round the blind side of the Ross from the spy boat and then off loaded some goodies - all good fun. Later that day the Dioptric Surveyor made its first trip over to the Laser ship Communicator, then it just anchored between the 2 of us. That first Sunday the Spy boat was there brought more sight seeing boats out from the UK and the poor old spy boat did not know what ship to concentrate on. As it was we did feel a bit sorry for them - we had all these people coming out to us with goodies, the Sunday papers etc, and I don't think anybody once put anything aboard the spy boat that weekend. It was not till Monday, around the 12th August 1985 at lunchtime, that we found out what was really going on. I was looking for news items for the Caroline 1pm news and on the BBC TV Teletext when I saw a headline 'Caroline and Laser Watch Out' It stated the UK government were out to close our supply lines and the Technology Minister Geoffrey Pattie had also described us as 'Potential Killers that must be removed'. What had happened was the 2 stations had become so popular that local stations were losing listeners to us - they were best not pleased and wanted action taken. The Government boat also did a really strange thing every Friday around 6.30AM. It would go into Harwich about 16 miles away to stock up so it would be gone nearly all day. Anything we needed to get out in a hurry from the UK we would get out on a Friday morning. Another time they followed a boat that came with some press people onboard all the way back to Whitstable, and while they were doing that we did a quick DJ change over from the UK. Other things we used to do were to start our main ships engine if they tried to come to near to us in their rubber dingy. We had a long anchor chain down and would run the ship around on that so they could not get too close. They also tried to measure how much fuel we had on board by seeing how low/high we were in the water so we just pumped it around different tanks. Tanks we did not use were filled with salt water - one day half emptied them the next filled up a bit etc, so they gave up on that. We were lucky on the Ross as most of our supplies were coming from Europe at this time so Eurosiege had no affect on us apart from we must have had about £10 million of free advertising for the station. Every day we were on the national news/local news, national newspapers, the whole lot, and all thanks to the British government. We also noticed the mail increased 20 even 30 fold after this, and lots of people saying blimmy thought you lot went off air years ago welcome back! Unfortunately Laser's supplies, or most of them, were coming from the UK and after a while the Spy boat realised this and started giving them a hard time - almost giving up on trying to get Caroline off air. On the 6th November Laser sailed into Harwich, it's fuel and other supplies low, escorted by the newer / bigger spy boat and former sister ship to the communicator, The Gardline Tracker. Eurosiege 85 went on for about another week after this then once again Caroline was left all alone in the North Sea. In closing I think anyone who was out on Caroline during those 3 months would say 'it was so much fun and we all got such a big lift with all the support we kept getting' .... We were not going to roll over and surrender.